I am taking a corespondence course on "Overlay crochet" with Melody McDuffee. This is the basic square (designed by Melody). I left off the final round because none of the colors I used looked right. The technique is fun and amazing. It is like looking into a kaleidescope! Each round changes the form and the colors change as they interact with eachother. I have been so busy creating that I have not updated in a while. I am taking a correspondence course about "Overlay Crochet". The teacher is Melody MacDuffee. It is a technique that uses a variety of crochet stitches laying over and around each other to create a richly textured and colorful fabric. 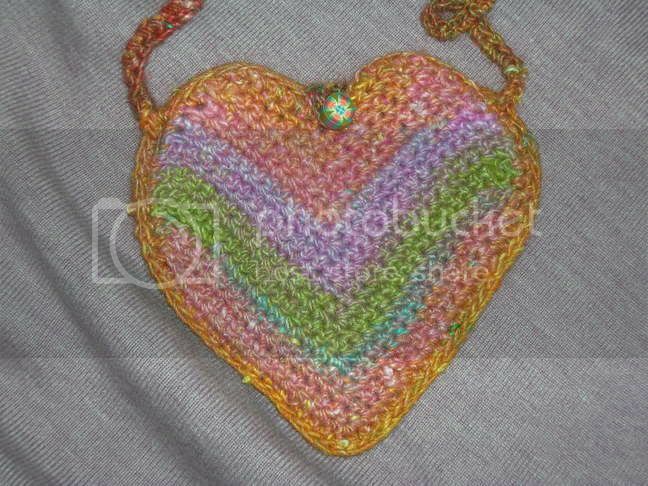 The course work is a basic overlay crochet square. I finished that the first week and now I have been designing and playing around with this versatile technique. I have been using some of the stitches in my freeform crochet and it is so beautiful. It creates a wonderfully textural fabric. I made a couple of picture frames and I am working on a bracelet now. I have also made numerous squares just to play around with this wonderful technique and to see how different materials and color combos work together. I will post some pictures later. I had my Creative Caravan Open House last night. My friends and family came to oooh and aaahhh over all my work. I sold stuff too. I have been trying to get some bead and jewelry parties together and finish my website. I am really ready for CC to take off. I feel like I'm just going in too many directions at once. I need to slow down and do one thing at a time. I just don't know what to do first (one thing leads to another and all that). Here are two of the heart purses I recently completed. They are completely freeform. Each one is a little different. I'm working on writing down a pattern for them. Everyone who sees them wants one. These are made with Noro Silk Garden yarn. I have done others in other yarns, but I love the affect of the changing colors. The backs are different, because of the long color changes in the yarn. I'm so proud of myself! I finally figured out how to get my pictures into photobucket and onto LJ. I posted the pictures of the knitted mermaids for Daphne and Fiona. I guess I should have written this entry on that journal entry. Oh well, I guess I'm not such a genius after all. I may get the hang of technology some day. It's Skyler's 12th Birthday! Happy Birthday Skyler! I'll post some other pictures soon (now that I know how). Knitted Mermaids- Original Design by Allie Thompson (me). 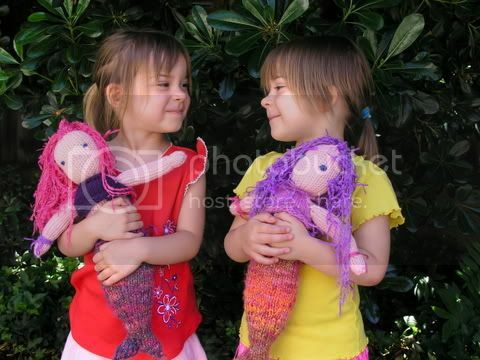 Daphne and Fiona with their Knitted Mermaids. Free-form crochet group and tooooooo much inspiration! I just joined the International Free-form Crochet guild. It is so cool. There are so many members, which means that there are so many pictures and the topic discussed is so cool. I've been doing free-form for so long and did not know that it was actually something that other people did. I have seen a couple of books on the subject, but I have never met anyone who actually does it! I have been a crocheting fool lately. I can crochet really fast, so I can make things really quickly. I made a couple of pretty crochet headbands (one of them Jasmine took off with). 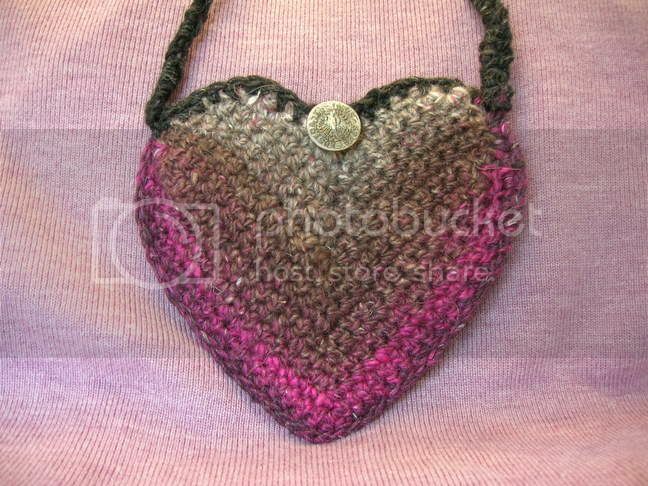 I have been making these really pretty crochet heart purses too. 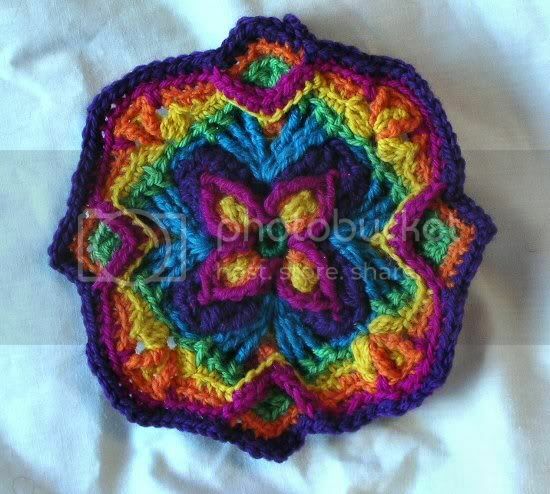 I used Noro Silk Garden (very beautiful!) I will try to get Jasmine to take pictures of some of these things and I will post them soon. I have been so busy these last few days. D'Arcy and I had our Healing Day on Saturday. It went very well. I feel like the healing energy is really starting to flow. I am going to go to Lisa's tomorrow and show her and Tyler some acupressure points to use during labor. I am really looking forward to that! I'm going to go create for a bit before the kiddos wake up. I'm so technologically impaired! I am trying so hard to figure out how to make my web-site and I just can't do it. I don't know what to do. I have all these wonderful kits and jewelry to sell, but no way to market them. I wish I were better at computers and marketing. The knitted mermaids came out BEAUTIFUL! I will try to figure out how to post some pictures of them. I am finally emerging from my creative slump. I don't seem to have enough time in my day to create everything I envision! Creative Caravan is on it's way to success and the web-site should be finished soon! I am hosting a Mother's Day of Healing next weekend with a new friend, D'Arcy. We are having some other moms over to do some Reiki and Acupressure. I am excited to get my healing energy flowing again. I've had several acupressure questions from friends lately and I feel like it's time to start extending this beyond my immediate family.